Charles Franklin Kettering was born on a farm near Loudonville, Ohio, August 29, 1876. After graduation from high school, he accepted a teaching position in a one-room rural school. Although highly successful as a teacher, his mind was set on going to college. In the summer of 1896, he entered the College of Wooster (Ohio). As a result of long and intense hours of study, his eyesight deteriorated to the point that he was forced to leave college and return to teaching. In 1898, he entered the engineering school at Ohio State, but again his poor eyesight forced him to drop out during his freshman year. For the next two years he worked on a telephone line crew, and then once again entered Ohio State, finally completing his electrical engineering degree in 1904. After graduation, Kettering took a job in the inventions department at the National Cash Register Company (NCR) in Dayton, Ohio. There he developed an electric motor for cash registers, the OK Charge Phone for department stores and several other contributions to a revolution then taking place in business machines. In 1909, Kettering and Edward A. Deeds, his associate at NCR, formed their own industrial research laboratory, the Dayton Engineering Laboratories Company (later known as DELCO). 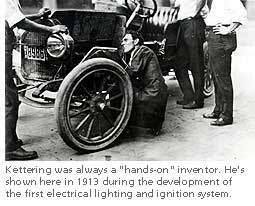 Within three years, they had produced a new all-electric starting, ignition and lighting system for automobiles. The system first appeared as standard equipment on the 1912 Cadillac and as its use spread, women could conveniently become drivers without the assistance of a chauffeur. DELCO was eventually sold to General Motors and became the foundation for the General Motors Research Corporation of which Kettering became vice president in 1920. 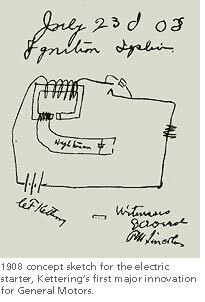 The list of innovations and inventions that are credited to Charles F. (nicknamed "Boss") Kettering is impressive. His book of patents contains more than 300 separate applications that range from a portable lighting system for farms to coolants for refrigerators and air conditioners. Other patents included a World War I "aerial torpedo," a device for the treatment of venereal disease, and an incubator for premature infants. Duco paint and Ethyl gasoline were also his ideas and he was instrumental in their development. He had interest in the development of diesel engines, solar energy, and was a pioneer in the application of magnetism to medical diagnostic techniques. 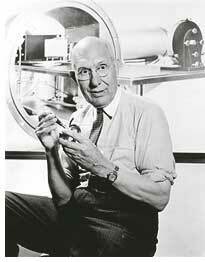 He and his wife, Olive, had one son, Eugene Williams Kettering, who worked with his father on diesel engine development and was largely responsible for the adoption of the diesel engine for railroad use. 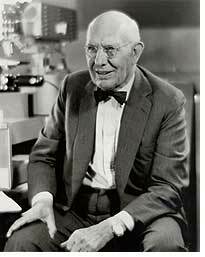 "Boss Ket" retired from General Motors Research in 1947 but served as a consultant over the next decade. Following a series of strokes, he died on November 24, 1958.